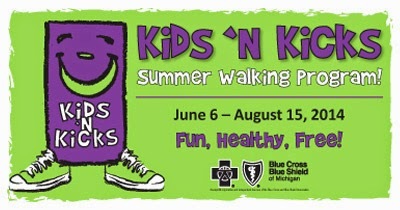 Kids are invited to join this FREE and fun Michigan Kids 'N Kicks Summer Walking program sponsored by Blue Cross Blue Shield for an opportunity to stay active during the summer months, rain or shine, and win some cool prizes along the way. Sign up now at the Fairlane Town Center Customer Service to receive a membership kit, which includes a Keep On Moving book to keep track of distances walked and also showcases various kid-friendly activities found throughout the center. Registered participants are welcome to walk a session in the morning or in the afternoon, earning a completion stamp in the Keep On Moving book. Once a walker fills their book, they will receive a special prize. Fairlane Town Center will also hold special FREE weekend wake-up events on select Saturdays for participants and host a celebration lunch and award ceremony at the conclusion of the Kids 'N Kicks program. The events are free but require pre-registration. - Kids are welcome to walk a session in the morning and a session in the afternoon of the same day, earning a completion stamp for each walking session. The Keep On Moving book showcases various kid-friendly activities and lists the number of calories burned during 15 minutes of each activity. During each week there will be pictures of kid-friendly activities placed as puzzle pieces throughout the Center. When a walker spots an activity, they will confirm it with Customer Service and receive a stamp for their book. Once a walker fills up their book, they will receive a special prize. A BRAVO! Chef of the Day will teach the walkers how to prepare a simple, healthy meal. All program participants will receive a FREE healthy lunch. RSVP by June 17. *A free lunch is provided only to children signed up in the Kids ‘N Kicks Summer Walking Program. A parent or guardian is required to accompany the child during the entirety of the event. A Zumba Fitness instructor will lead children in a fun, easy-to-follow, dance-fitness program. Comfortable clothing and sneakers are suggested. Parents and guardians are encouraged to participate. RSVP by July 8. A Belightful Yoga instructor will lead children in a fun, easy-to-follow yoga program. Comfortable clothing is suggested. RSVP by July 22. Blue Cross Blue Shield of Michigan will provide a health activity presentation. RSVP by August 5. A healthy lunch will be provided. Goody bags and award certificates will be given to every participant and the Top Walker will be announced. RSVP by August 12. For more information and to register for the Blue Cross Blue Shield of Michigan Kids 'N Kicks Summer Walking Program, visit www.shopfairlane.com/kidsnkicks or call Fairlane Town Center at 313-593-3546.